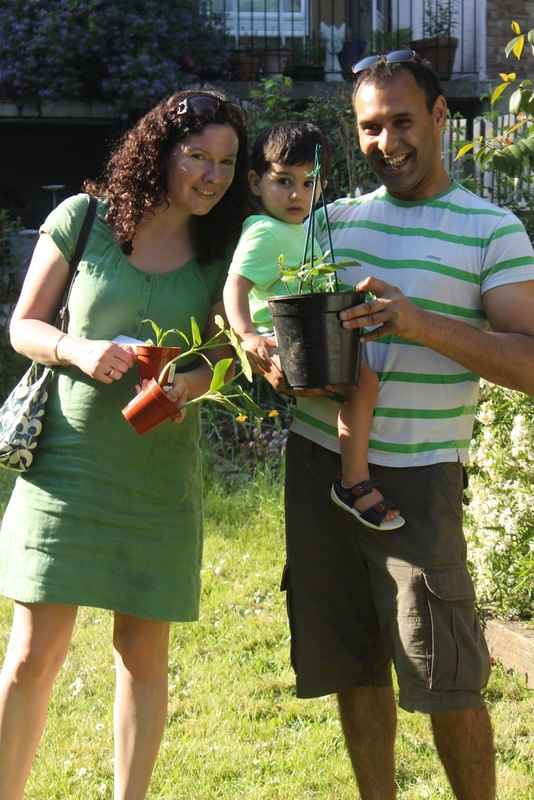 At the Secret Garden Club last Sunday we looked at different types of companion planting – putting plants together that will help each other in some way – and how these can benefit your garden. Some plants will ward off pests, either by their smell, or secretions from their roots, or simply because they have sharp thorns. You can grow these plants close to those that are vulnerable from such pests in order to give them protection. Conversely you might use plants that are particularly susceptible to a pest as a ‘decoy’, to draw them away from another more valuable or delicate plant. Some plants will attract beneficial insects, such as lacewings, hoverflies or ladybirds, to the garden. Place these close to plants which need pollinators to set fruit. Some plants, notably legumes (peas and beans), will enrich the soil for other plants. Tall sturdy plants can be used to provide support for other plants, such as climbers. Trailing plants might act as ground cover, suppressing weeds and acting as a mulch, reducing water evaporation from the soil surface. We discussed in some detail one very traditional companion planting method from the Americas, widely known as the Three Sisters and practised across North America from the midwest plains to Mexico from pre-Columbian times. The Three Sisters themselves are the staple ingredients of the traditional Native American diet: corn, beans and squash. In America, the three are sown together and provide sustenance and support for each other. The corn provides a strong upright stake for the beans to climb up, winding their stems around the main trunk of the sweetcorn. These bean plants also act as ‘guy ropes’ for the corn, keeping it stable in the wind.The squash plants are trained to trail around the foot of each corn/bean combo, their broad leaves shading the soil, keeping it moist and suppressing the weeds. A further benefit of the Three Sisters scheme is the ability of the beans to nourish the soil. Peas and beans are all able to fix nitrogen from the air through their roots in the soil. As nitrogen is one of the main nutrients required by plants, especially leafy plants, this means that the soil is left enriched after the Three Sisters crops have been harvested, ready for the next year’s planting. It’s a highly sustainable planting scheme. The UK climate is not the same as the American plains or the semi-tropical climate of Mexico. It’s more unpredictable, and so the Three Sisters method has to be adapted. We can’t sow each seed at the same time, as the beans will grow much faster than the corn and will overwhelm it. So we need to start when the corn is already about 4-6 inches high. Sweetcorn is very easy to grow from seed, or you can readily buy seedlings from garden centres. 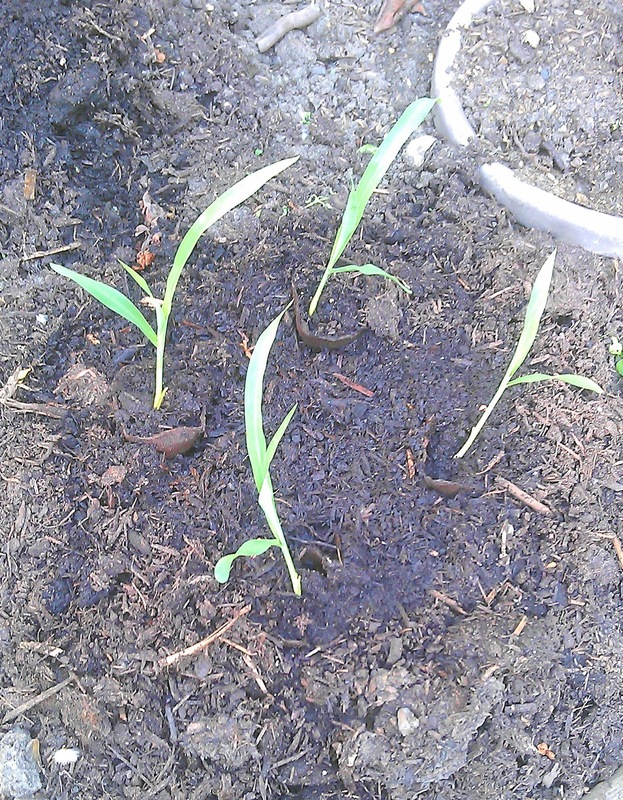 Beware sweetcorn sold with a number of plants in each pot. They dislike having their roots disturbed too much and if you are having to tease seedlings apart to separate them when you transplant them you are liable to damage the roots. Better to buy those which have a single plant in a plastic or polystyrene module, or to grow your own from seed in coir pots, one seed per pot. With coir pots, you don’t have to turn the seedling out when you transplant it, you just dig a hole the same size and shape as the coir pot, drop the pot in, and firm the soil around it. No root disturbance at all. The best beans to use for Three British Sisters are ones which you leave to dry on the plant, not runners or French beans which need regular picking. These should be sown when you plant the corn seedlings, when the soil has warmed up and all danger of frost has passed. 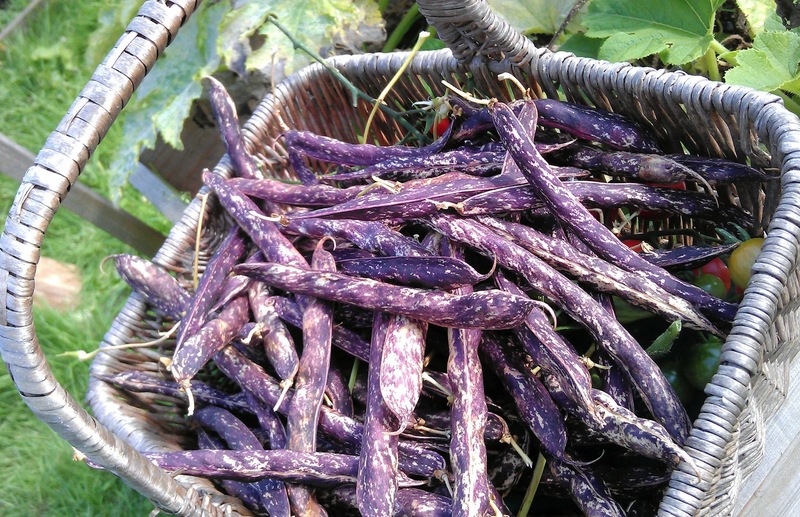 We used the climbing borlotti beans Borlotto Lamon from Seeds of Italy at the Secret Garden Club – borlotti beans are easy to grow in the UK and are flamboyantly beautiful: bright crimson seed pods flecked with cream, which you shell to reveal creamy-pink beans flecked with crimson. With a dense floury texture and good flavour, they’re a delicious and versatile bean in the kitchen too. For the squash Sister, any squash with a trailing habit will work well. So don’t use a courgette, which grows as a bush. Butternuts, spaghetti squash, Crown Prince, or a Halloween pumpkin – all these will do very well. We planted specimens of all these at the Secret Garden Club, plus a Japanese variety, Futsu Black (from The Organic Gardening Catalogue) and a sweet, dense-fleshed Italian variety, Marina di Chioggia (Seeds of Italy, again). Start squash off in small pots, either indoors or in a greenhouse. Sow two seeds to a pot and keep the pots covered until they germinate, which should only take 5-7 days. Snip out the weaker seedling before transplanting. 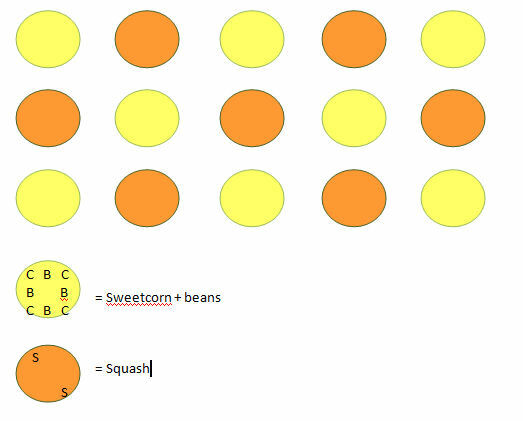 Once the squash plants start to spread, try to train them in a circle around the foot of the corn/bean plants. I say ‘try’ because squash seem to have a wanderlust and will grow three feet in the wrong direction as soon as your back is turned. Many times I have returned from two weeks holiday in August to find that the squash have run rampant in my absence. The Native Americans built up mounds in the soil about 45cm across and 10cm high and planted the Three Sisters in the mounds. Creating similarly-sized square or circular mounds using a mix of manure, kitchen compost and commercial compost makes sense in the UK too: all three of the Sisters are hungry plants and need lots of nutrients to get going. Giving them a specially enriched mound should get them off to a good start. In dry areas, the Americans would traditionally make a shallow depression in the centre of each mound to hold water. We could do well to copy this in our drought-ridden, hosepipe-banned times. The minimum viable size for a Three Sisters plot is 3.5m x 3.5m. It’s a considerable space commitment, but remember you are growing three crops in the area. Less than this and the corn may not pollinate properly. Corn is wind-pollinated, which is why you should always plant corn in blocks – plant in a row and the wind may not blow in the right direction to ensure pollination. Each circle above represents one 45cm diameter mound. The corn and bean plants will grow together on a mound; alternate mounds are left to squash which will need more space. In the mounds shown here as yellow circles, plant four corn seedlings in a square shape. There should be at least 15cm between the plants. Then, plant four bean seeds, one between each corn seedling – you should be able to simply push the bean seed into the ground with your thumb or forefinger. Close the soil above it and firm the surface. In the mounds shown here as orange circles, plant two squash, as far apart as possible on the mound. Water all the seedlings well. The beans should germinate within two weeks, by which time the corn should be about 30cm high. As the beans grow, they may need to be tied in initially to encourage them to grow up and around the corn. 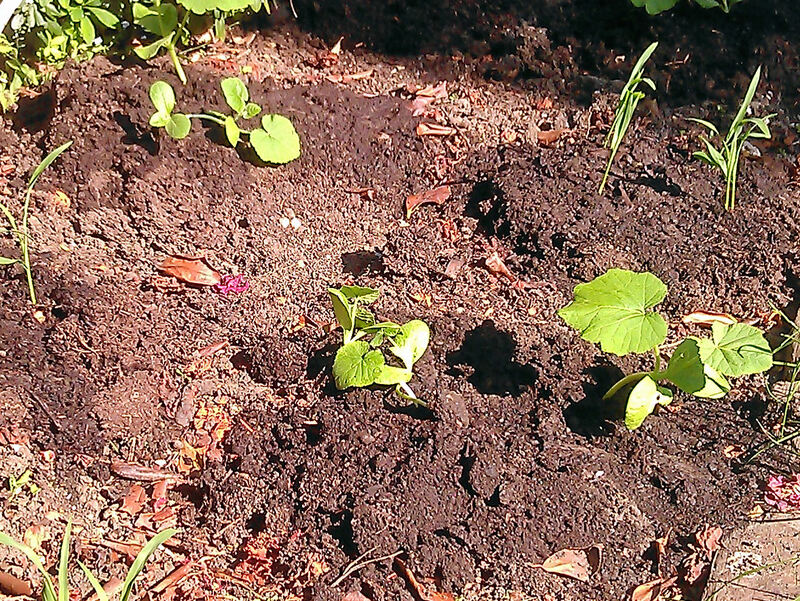 The squash plants may take a while to get going, but will grow rapidly when they do. They will need training to keep them to the Three Sisters growing area. When squash fruit begin to form, place a clean tile underneath the fruit for them to rest on to protect it from the dirt and creepy-crawlies. Once a single plant has produced three fruit, stop the growing tip – this will help the plant concentrate on growing really good-sized fruit. Depending on the variety, the sweetcorn should be ready to harvest from late August or September. Borlotti beans and squash can be left to mature on the plant. Make sure you lift them before the first frost. The harvested squash should be taken indoors and leave to finish ripening in dry warmth and light. During this process they may well change colour from green to orange or yellow. Stored properly, they can be stored for 4-8 months. There’s no reason why you shouldn’t pick borlotti bean pods to cook and eat fresh. They’re delicious, especially served with a squeeze of lemon, some salt and a drizzle of olive oil. But leave at least some on the plants to keep for use in winter. As summer wears on into autumn, the pods will change from bright pink flecked with cream, to a brown papery husk. Pick the pods as late as possible, but before the first frost, usually in the middle of October. Thread the pods together and hang them up somewhere airy until all the pods are completely dried out, about 2-3 weeks. Then shell the beans. They should be dry already and rattle when shaken together and clatter when dropped on the work surface. If they land with a soft thud instead, they need more drying. Finally, put the shelled beans in a freezer bag and seal. Place in the freezer for about 48 hours. This quick freeze just ensures that if the beans were harbouring any bugs, mites or insect eggs, that they are killed off. Once out of the freezer, spread the beans out briefly on kitchen paper just to check they’re dry again, then pour into a jar with a tightly fitting lid. Keep in a dark cool place and they will last for months – until your next bean harvest, in fact, if you haven’t eaten them all by then. Because legumes (peas and beans) fix nitrogen from the air through their roots, they nourish the soil. This means that the soil maintains its own fertility without you having to add large amounts of fertiliser. However, they fix nitrogen for the next crop. So if you are planning to plant your legumes with a view to feeding the soil for another crop, choose something that will carry on growing after the peas or beans have finished. It’s also good to follow peas with something that likes nitrogen, some thing leafy, eg, brassicas, squash. Once the peas have died down in July-August, we’ll leave the plants in the ground to fix nitrogen through their roots for the benefit of the cavolo nero which will carry on growing throughout the winter. At Sunday’s workshop, guests created a smaller version of this wigwam with cavolo nero seedlings and young runner bean plants. These were planted up into 15cm pots which can be transferred into the open ground in a couple of weeks or so when the beans get too big for the pot. Carrots and onions make excellent companions in the vegetable bed. Many gardeners find that they need to protect the carrot crop from carrot fly, a dull-looking brown fly which flies low to the ground and can detect the smell of carrots from half a mile away. The female will lay her eggs in the soil close to the carrot roots, and when the larvae hatch, they start to feed on the growing carrots in the ground. When you dig up the crop, you’ll find tell-tale brown streaks and tunnels boring into the carrot itself. edge of beds to repel aphids. However, you can protect your carrots to a certain extent by sowing them in-between alliums (garlic and onions, mainly, although you could try leeks as well for a late-growing carrot crop – leeks don’t really get going until late summer). The smell of the onions is said to mask the scent of the carrots, so that the fly doesn’t realise the carrots are there. In return, the carrots are said to mask the allium scent for the onion fly, which preys on onions and also garlic and shallots. Garlic and onions are good for repelling many different insects, including aphids. The sulphur accumulated in their roots may also act as a natural pesticide. Some people plant alliums all around the edge of their plot or patch for this reason. Of course, you need to be sure that you don’t have any of these pests inside the plot already or else you will trap them in instead of keeping them out. Specifically, however, garlic and onions can be sown around roses or in the rose bed to help deter greenfly and blackfly. Chives are also excellent for this: their low bushy habit and mauve pom-pom flower look attractive among the roses. 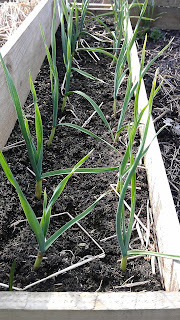 Garlic can also be used directly on plants to deter aphids. Jekka McVicar of Jekka’s Herb Farm recommends crushing 3-4 cloves of garlic and bringing to the boil in a litre of water. Let the garlic cool in the water and strain. This spray can be used on the leaves of the plant. I find it works best as a preventative rather than a cure. Marigolds are well-known for their insect repelling properties. They are especially associated with brassicas: plant marigolds around your cabbage and cauliflowers to ward off the whitefly. Furthermore, the roots exude a substance which are toxic to nematodes, including those which attack tomatoes. So plant marigolds around the tomatoes as well. It can be confusing to buy marigolds and to know which is which. French marigolds are actually Mexican. African marigolds are also American in origin. Pot marigolds are a different thing again. This is where the Latin or botanical names come in handy. Tagetes is the name to look for. 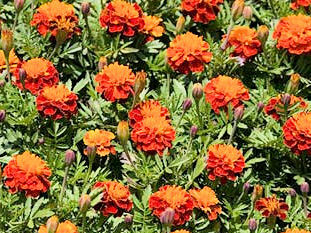 French marigolds are usually varieties of Tagetes patula. African marigolds are usually varieties of Tagetes erecta – and often used as food colouring. The botanical name for pot marigold is Calendula. Extracts from Calendula are used a lot in cosmetics, and also useful for repelling insects but they don’t have the same root secretions. Having talked at length about insect-repelling plants, we also looked at growing plants for their insect-attracting qualities. Not all insects are pests – far from it. Some, such as ladybirds, hoverflies and lacewings are known as beneficial insects. We think of bees as being the main pollinators of plants, but hoverflies also feed on nectar and are excellent pollinators. Plants which need a pollinator, such as squash and courgettes, and fruit trees will benefit. Hoverflies are doubly welcome in the garden because their larvae will chomp their way through massive numbers of aphids. Ladybird and lacewing larvae are also enthusiastic consumers of aphids – a very good reason to attract them to the garden. Plants such as achillea (yarrow), as well as borage, the poached egg plant and comfrey are good examples of plants which will attract beneficial insects, while lavender and roses are well-known for buzzing with bees during the summer. Companion planting will help your garden to look attractive. It encourages you to consider a greater variety of planting, which is always good for biodiversity, and different layouts and arrangements of plants within the plot. It helps your garden to sustain itself – with well-selected companion plants, your garden should be humming with life, not sterile and formal. Adopting companion planting methods should mean you can greatly reduce or eliminate any use of pesticides. It should help you to raise better crops and improve the sustainability of your soil. At the Secret Garden Club, we’re aiming to create a harmonious combination of edible and ornamental plants and companion planting has found its way into the heart of that plan. Golden Harvest Organics – plant lists and benefits of growing together. Victoriana Nursery Gardens – the Three Sisters – growing the Three Sisters in the UK climate. We followed many of the suggestions here for the Secret Garden Club’s Three Sisters plot. Renee’s Garden – US site with the story behind the Three Sisters tradition, plus Three Sisters planting diagrams. National Vegetable Society – Good overview of companion planting principles plus plant lists. Laura’s Organics – page on attracting beneficial insects to the garden. To find out about the Native Indian inspired food that MsMarmite served go here. Thanks for all your great tips. More power to your blog!